Prior to Luke’s sentencing we raised over $13,000 to cover the cost of legal fees. Now we need to fund raise for the next few years while Luke is in prison. We will need money to cover Luke’s commissary, phone calls and other expenses for him in and out of prison. All donations, however small, are appreciated. Because Luke will need money over a long period of time, we encourage those who can to make recurring donations. You can make recurring donations by checking the “Make this recurring (Monthly)” box (beside “Donation Amount”) after clicking the donate button below. Nobody from the support committee is being paid at all or making any money. All of the money raised is going to Luke. 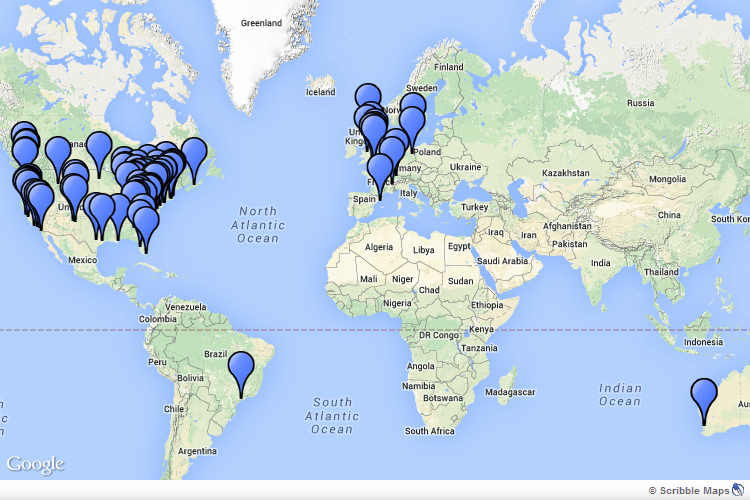 NEW Donation Map: Support for Luke has been pouring in from all over the world. The map below shows where all of the donations have come from. Click the image to view an interactive map. It would be great if ya’ll would take bitcoin! we would love too! we just don’t know how exactly. any pointers? You can set up a Bitcoin wallet at coinbase.com and then link your public (not private) key somewhere on this donation page – people can then send Bitcoin to your wallet, which you can sell on any exchange for USD and forward to Luke. Pingback: Luke Sentenced « Support Luke! Pingback: Becausewemust | Luke O’Donovan Needs Vegan Food! Can we write luke support letters? He’ll be there for about a month before he gets transferred, so please write soon! We’ll update it on the “how to help” section when he gets moved. Do you all have a wishlist for Luke on amazon for books or anything? Thanks! can we order books to send yet? While we wish we could send Luke a whole library, he is unfortunately limited to 8 books at a time, so we are helping to control the flow of books by staying in communication with him so that we know when he is ready to get rid of a book in order to receive another. So we’re sorry to say that unless something on that front changes, we won’t be posting a wishlist for everyone to send books. Thank you, though! I have written to Luke a few times but haven’t heard back since mid September. Is he okay? We speak to Luke regularly and he is doing well. Although he is not always able to respond to every letter, he is definitely reading them and is very appreciative. Please keep writing if you can!